What is Oktoberfest: Oktoberfest celebrations start in September. 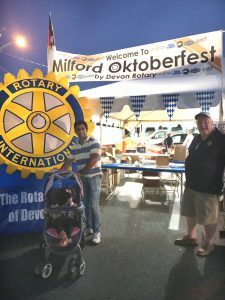 Oktoberfest in Milford was a fundraiser for the Devon Rotary Club, Which benefits the Club’s activities including scholarships, grants, and charitable giving. There was a $10 entree fee (which we didn’t know before going there 😉 .The Germans are stereotypically known for their beer drinking capabilities. Oktoberfest is the world’s largest beer festival held annually in Munich, Germany. Many cities across the world hold Oktoberfest celebrations that are modeled after the original Munich event. So now we know it’s all about beers. Ok, not all but mostly about beer. In my city, the Oktoberfest featured 12 different craft and seasonal beers on tap. After entering it’s up to you if you want to start with beer or you just want to eat shop or enjoy the music. What to do in Oktoberfest: There was a big itenary for the complete day and those who can actually spend an entire day there had lot many things to do. 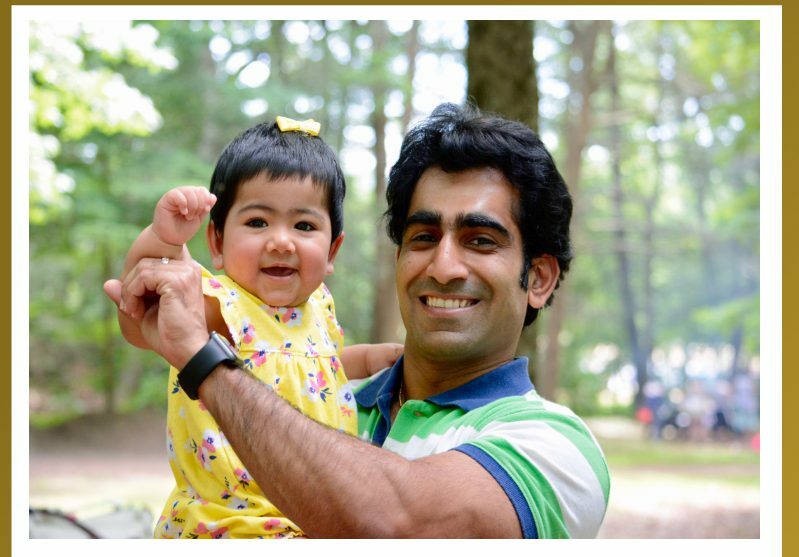 But people like me who have a little girl to take care of, cannot actually spend whole day. 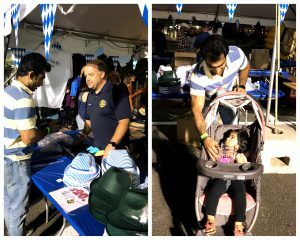 For all the shopaholic people there were Oktoberfest merchandise(including mugs), German hats, t-shirts, and Das Boot available for purchase. There were raffle Prizes (like A Big screen LCD) to win. For all the foodies there was wide variety of foods, including German and American fare. Basically every age group have something to do and enjoy. As far as entertainment factor is there you have Chris and Ronnie an authentic Oom-Pah Band and traditional German dancers. What we did In Oktoberfest: when we reached there It was almost dark but we were not bothered because it looked like party was just started. Lalit bought one Oktoberfest Beer Mug. There was Wine too but Lalit is all into beer. He chooses ‘Oktoberfest’ beer (yes there is a beer named Oktoberfest) out of so many options and we headed to meet our friends. We also met some new people there. Jianna was tired of sitting in her stroller by now so she started her tantrums to get out of it. While walking she loved all the attention she got from people around her. It was like she started to enjoy the place. We bought her favorite pizza and she was all set for the evening. 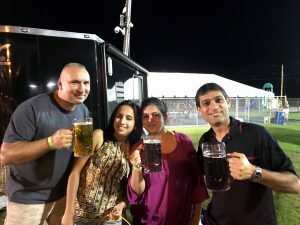 I am not a big fan of beer but I tried Oktoberfest beer from Lalit’s mug and I actually liked it. I ate ‘Deep Fried Oreos’ for the first time and it was good. 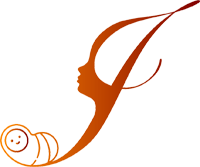 Why it was all ‘WORTH IT’: We spent around 3 hours in a full day event and still I thought it was all ‘Worth It ‘because I got to experience something new. Even if you don’t drink you get to see a new culture. We had good food, good beer, good music, good company and a good change from daily routine. What else you need on a Saturday night? Going out with kids is challenging and sometimes we avoid going to places just because we think what our kids will do there. But from the experience of this beertastic evening at Oktoberfest I can say that we over think 🙂 . Till the time we don’t take them to some place we don’t know how they are going to react. So try new places, new events with your kids. Not just Jianna, we all were too tired. I am glad that I went to Oktoberfest and if I would have not gone I would have missed out one hell of a good time. When was the last time you went somewhere which was not planned? Do you actually like going to unplanned outings or you prefer knowing in advance? 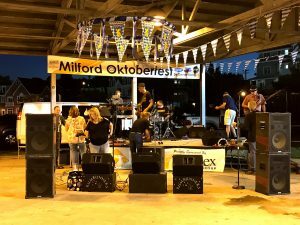 Have you been to Oktoberfest or is it in your bucket list. I am sure it is in mine now (I mean the Germany one 😉 ). 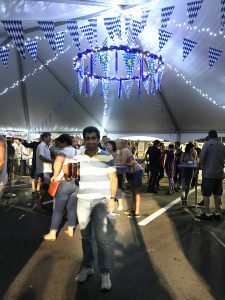 If you liked reading my experience of Oktoberfest leave a comment. Or you can share and subscribe too. Never a beer in my life. Enjoyed this post because of all the fun filled photographs. Glad you had a good time amidst the mad rush of a routined life. Deep Fried Oreos?!?!?!? No way! I have a funny feeling they don’t have those at the Munich one, any more than the cupcake I ate at a local “historical” Harvest Festival this weekend was historically accurate! 🙂 Glad you had a fun time! What a fun community event! 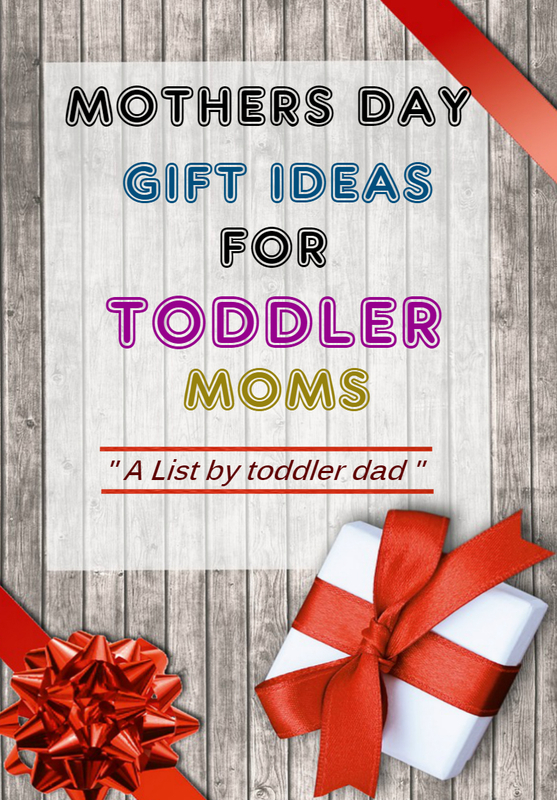 We haven’t adventured out with my daughter to these events yet but they are on the list! yes its on my list too for next year. but will go little prepared next time. Looks like fun! I miss doing things like this. I found about Oktoberfest via Instagram and it looks so much fun. Oh man I love the vibe of Oktoberfest! This one looks so fun. Cute pics, too! Thanks Jordan . We enjoyed a lot. I don’t drink but looks like you guys had a fabulous time there! Yeah it was relaxing and something new for me . I don’t drink, but I love going to things like this for the culture and atmosphere. Looks like it was a fun time! I experienced a new culture and it was really good. Awww… now I wish I was there! Ha ha . Do try the one in your city. I guess you will enjoy. 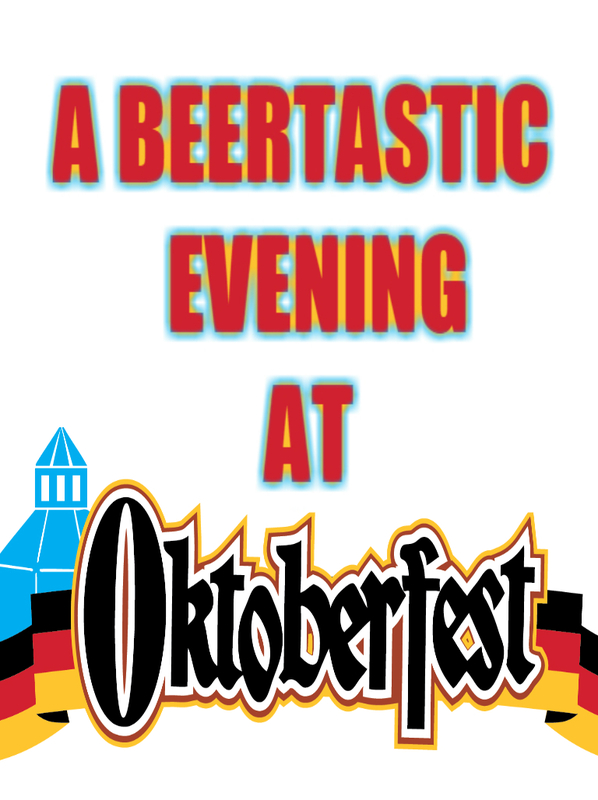 You ask “Why it worth it?” Cmon, if you drink beer – Octoberfest is the best place to go. I don’t drink alcohol, but even for me this place looks fun. Yes me too not a big alcohol fan but people like us can enjoy too. Yes Sarah. It was a fun event. 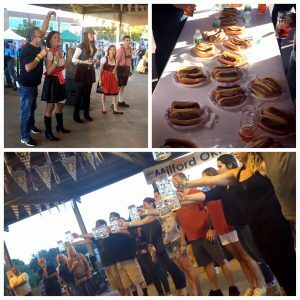 We have an Octobeerfest as well in our country. It’s really a fun occasion. I have heard a lot about Oktoberfest and its in my bucket list. I’m really excited to see that you went with the baby, which means I can go out with mine too! 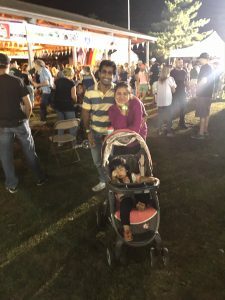 Great to know that you had a great time and specially Jianna, Didn’t knew that Oktoberfest was a beer as well:). 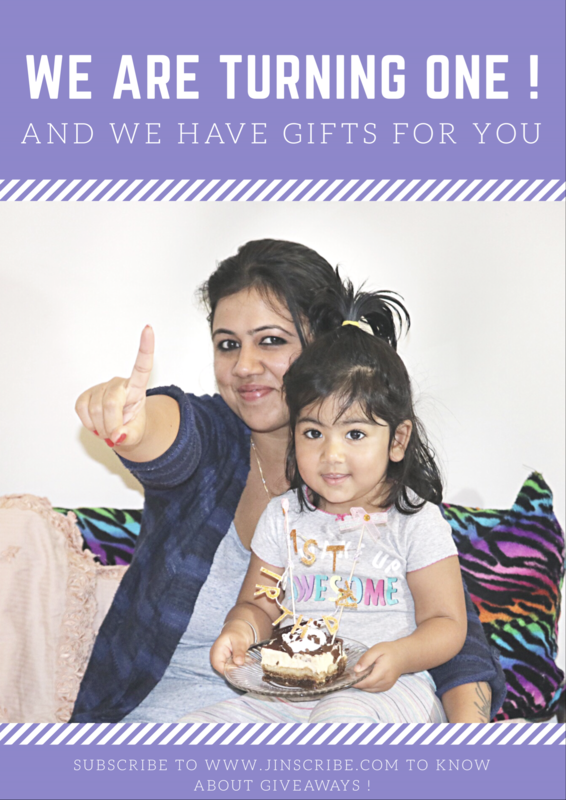 Yes, we think lots when it comes to going around with kids and mostly things are okay! Looks like you all had an amazing time. Getting out with kids is soooo hard but events like this are still fun especially with the outdoorsy vibe. Love Oktoberfest and can’t wait to visit on here! 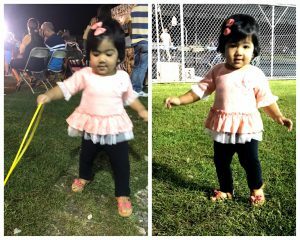 My girl also enjoys anything outdoors.do try going to Oktoberfest near you. I’ve never been to Oktoberfest, but I’ve heard it’s fun. 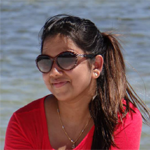 Outings with kids can be challenging, but worth it for a new and fun experience! Even I didn’t hear about it before going there. It really is fun . 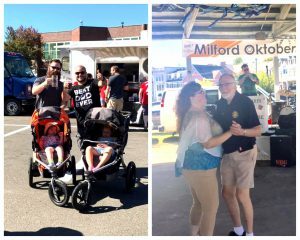 I’m not a beer drinker so Oktoberfest has never really been my thing, but it looks like you guys had fun! Overall, I prefer to have events planned in advance as having a baby makes it hard to just go to things at the spur of the moment.